Ah, yes, peace; the pursuit of which moved John Paul the Great Ecumenist and Benedict the Abdicator to join a collection of heathens, heretics, Jews, pagans, atheists, etc. in the Basilica at Assisi so that each could offer incantations to the deity of their choice. 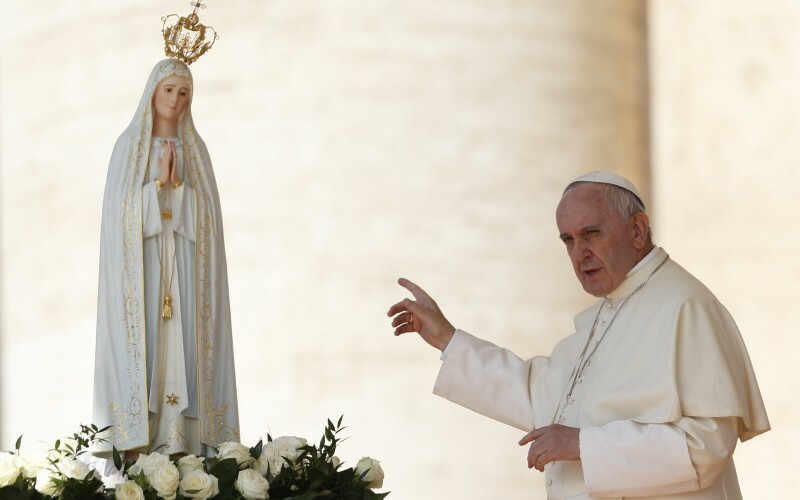 It didn’t work, and neither will Francis’ Fatima follies, which will include a so-called “prayer” composed by the very hand of His Humbleness to be offered later today at the Little Chapel of the Apparitions. 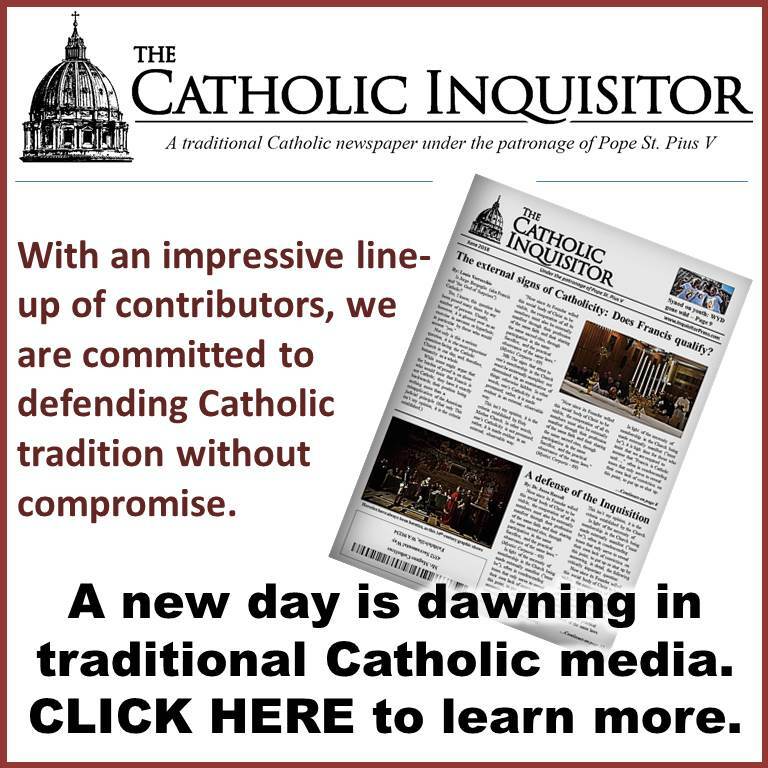 Catholic News Service has published an English translation of the 700+ word text. (Hey, it takes a lot of verbiage to instruct Heaven as to how things ought to be.) Following are some highlights. We know all-too-well that washing the feet, for Francis, is nothing more than an opportunity to show the world 1) just how humble he really is, and 2) that it matters not one iota whether or not a person rejects Jesus Christ and His Holy Catholic Church. Who really needs the Altar upon which the Holy Sacrifice, the Source of authentic Communion and harmony, is offered? I have something different in mind; the table whereupon religious diversity and human dignity is celebrated! While some might be fooled by the Catholic sounding words, you can be certain that Our Lady, Sedes Sapientiae, will not be. Rather, she will immediately recognize that standing before her is a dyed-in-the-wool humanist who has precious little regard for the true “Gospel message,” much less the mission that her Son gave to His Church; namely, to Christianize the entire world. Is this perhaps a moment of truth in an otherwise deceitful production; an admission that the man who is speaking only gives the impression of being the Holy Father? Brace yourself with prayers, sacrifices and acts of reparation. Time is running short. I couldn’t agree with you more, Mr. V. The “I’ll do it my way” is appropriate for a Vegas night club act (Sinatra), but not in response to any request from Heaven. There are so many things that make me very angry about this Bergoglio, his words and actions, but I think none so much as how he disrespects the Blessed Mother. When I’m tempted to think he might be acting out of a benign ignorance, I remember how he’s always dissed the Holy Virgin. And I think that is because he views her as the enemy, knowing she will crush every evil thing he has done. For him to claim that he prays the Rosary daily is beyond belief. Quite true, Louie ; time is running short. When God strikes, the vast majority of Catholics will be dumbfounded. It’s going to be a bloodbath the likes of which none of us can imagine. May we all humbly ask for the protection of Our Lady. Holy Mother in heaven protect the souls of your little ones in this hour of desperate need is all I ask of thee. Blessed Francisco and Blessed Jacinta did not give all for the gospel message. They gave all for very specific messages of Our Lady when She appeared to them at Fatima. The requests and warnings of these very crucial messages must be heeded for the benefit of all mankind. Nothing less will do. 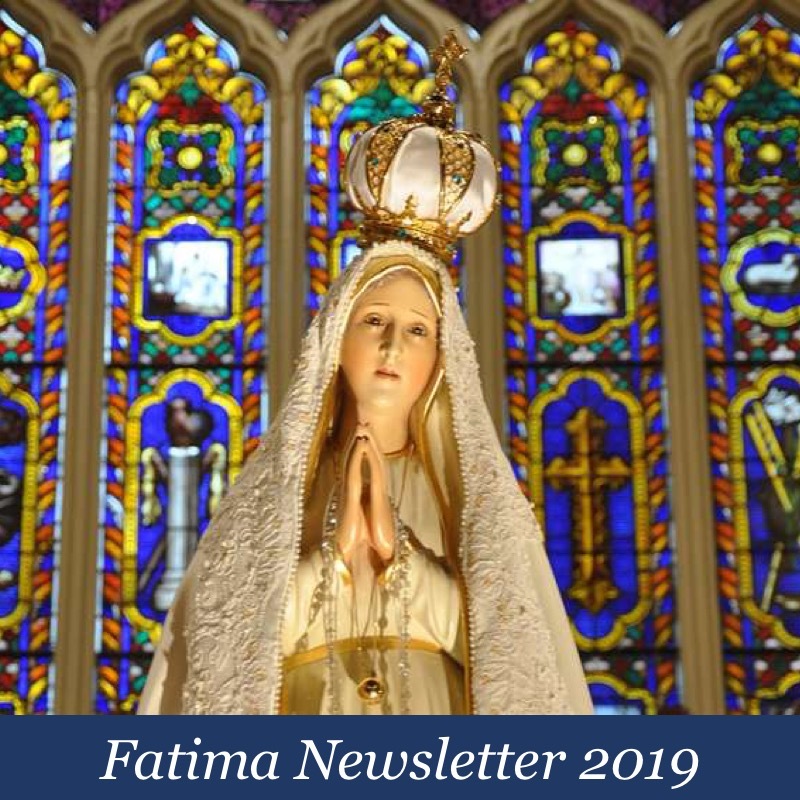 Our Lady of Fatima, pray for us–your children. Those children gave all to help save souls from hell. This “bishop dressed in white”, who gave the “impression that it was the holy father”, gives all to lead souls to it. As far as I’m concerned, Saint or no Saint, anyone he “canonizes” is still called a Blessed in my house. I agree with you comment on the post V2 “Saints.” I was just having this discussion with my oldest son last night. It isn’t that we aren’t certain that some of them are actually Saints. The point is, rather, that we have no authority to pick and choose amongst them. I am confident that a future pope will revisit all of these canonizations, follow the proper procedure, and clear up all confusion arising from the Canonization Circus. Until then, in our house they will remain pious individuals for whom we await their true raising to the alters. By the way, I believe that JP2 beatified them under his faulty new procedures as well. God bless! Kentucky, in your scenario, in order for a future Pope to clear up all the mess of the last 50 years, he would have to start by declaring the post conciliar popes as anti-popes. Which is basically what the sedes have been saying for decades. Nothing short of profound apostasy, arrogance, hubris, heresy and disrespect. There is no “bishop dressed in white” mentioned in the Secret that was written by the hand of Lucia dos Santos —- aka the TRUE 3rd Secret of Fatima —-after all. One more HUGE lie. A renowned handwriting expert in Spain with excellent credentials confirmed the handwriting of the discovered Secret (posted on Tradition in Action) to be that of Lucia dos Santos. That the 3rd secret has anything to do with a “bishop dressed in white” appears to be bogus. In the year 2000 the Vatican (Cardinal Ratzinger) apparently released a complete lie. Not part of a lie, but a complete lie. Thanks servant of Our Lady. I think we have all been so well duped that it is difficult to take all this on. We have been so well conditioned. Knowing what little we all know, it seems that this new revelation makes more sense than the other 3rd secret. Someone told me that it took months for Lucia to write the 3rd secret. Now I could see why, if this is what she was told. This makes more sense. I mean this is a woman who saw hell as a child , yet she found it so difficult to write the third secret and just couldn’t do it without special strength from God. And yet they have actually told us that the third secret was all about Pope John Paul 2 getting shot and something vague about a pope getting shot with arrows after climbing up a mountain. Why would it be so difficult for her to write about such martrys. It’s not like the Church has never had great martyrs even many many martyred Popes. A person who saw hell as a child would not have such difficulty writing about that. The sun almost smashed into the earth because John Paul 2 was going to get shot. Right. It couldn’t possibly be because Satan was about to infiltrate the Church with his demonic servants. No. Of course not. Oh, and by the way Lucia urged them to open it before 1960. Coincidence? I don’t recall secrets 1and 2 being so difficult to understand. Our Lady spoke clearly. This new revelation seems straight forward and not confusing. Horrific though. But we already know how horrific things are now in the church. We already know Satan has infiltrated The Church. Oh, but that’s not what The Lady came to tell us. She forgot that minor detail. The infiltrators are definitely under Satan’s influence…so this 3rd secret makes sense. For once this third secret seems to make clear sense. Thanks for sharing this bit of info. Thank you, Cortez! I am glad you looked into this proposed 3rd secret on Tradition in Action which was definitively written by Lucia dos Santos’s own hand. Here is the proposed 3rd Secret which is now known to have been written by Lucia dos Santos of Fatima. The “Bishop in White” story would also fit perfectly into the destructive plan of those who infiltrated the Church: The excessive speculation who this bishop may be takes the focus away from the Fatima message. It also allows them to control the narrative. By initially claiming JPII was the “Bishop in White” and now Francis painting himself into the role, additional confusion is created. It is also likely to deceive some into believing that Pope Francis will be martyred and double their sympathy for him. Cor Mariae Immaculatum, ora pro nobis. Also see the comment posted 5/19/17 on BREAKING: Francis responds to dubia. When the Witnesses come on the scene, we will see that Bishop in White go to his martyrdom followed by the true believers. It has been postulated by many that because of the rural setting and the education of the seers, in particular the two girls, that the likelihood would be that they would not know the difference between a Pope and a Bishop. In fact, if the person they saw had a mitre on where in the Pope at that point in time wore a triple tiara, God may have been showing them a post-Pope Paul VI pope by showing him with a mitre on and Bishops don’t normally wear white. Pope Paul VI and Pope John Paul I and Pope John Paul II would also fit that description. Have you considered that given the circumstances of Pope John Paul II’s death, and the number of imposters that were used during his papacy (see Blood Moons Over Fatima III and V), that Pope John Paul II could be the second witness? Contrary to popular belief, the two witnesses will not be Enoch and Elias. Apocalypse 10:11 tells us that St. John will be one of them which opens the door for the second one to be someone other than Enoch or Elias also. After all who would recognize Enoch or Elias let alone St. John but how many will recognize Pope St. John Paul II? He would be the most recognized of them all and therefore the most credible one of them all. Again, see the above references and please spread the word. 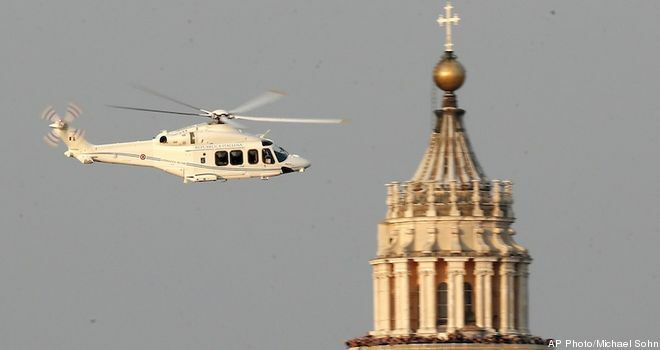 Once the reality sets in that the Great Apostasy is in our midst and that its essence finds its essential wellspring within the church which calls itself “Catholic”, that same church which controls the edifice, the religious, the priests, the bishops, the cardinals, the pope, the secular orders, the schools, the hospitals, all together preaching the anti-Gospel in near perfect cacophony, at once in preparation for the revelation of the person of the anti-Christ, everything then and only then, makes sense. This false facade of the One, Holy, Catholic, and Apostolic Church IS the Great Apostasy, as only Lucifer himself could have intellectively constructed. 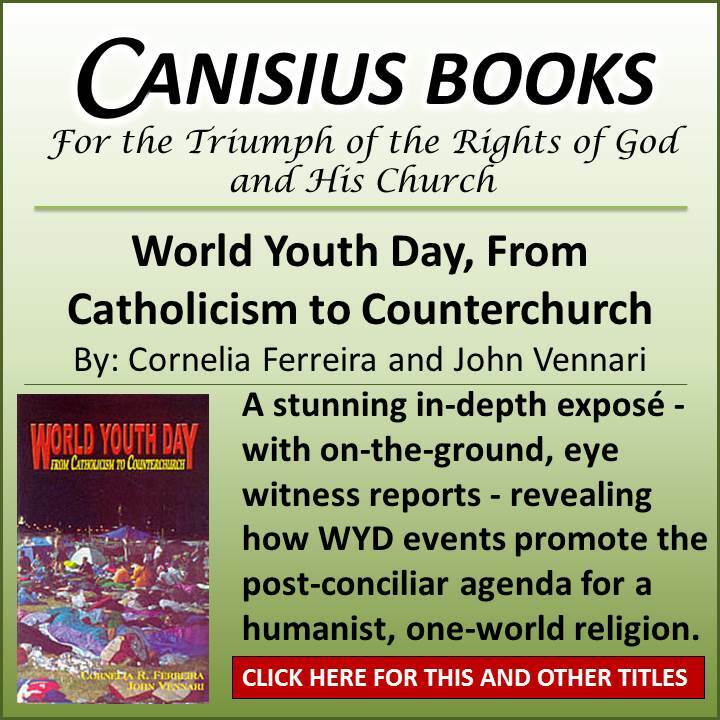 It is the same anti-Church which one of its very critical exponents, anti-Pope JPII, is credited with having spoken of, at the “Eucharistic Congress” in Philadelphia, PA, circa 1976. A “mass” which yields unending sacrilege and blasphemous heterodoxical praxis, is simply and utterly not of God, rather of Lucifer himself, as he mocks God through his useful minions, at once on their path to eternal perdition, as this thing itself speaks, objectively. This is the “mass” of JPII, BXVI, and all of the so called, post-Conciliar Popes. The Council is false of course, as it is the instrument of Lucifer, not of God. This too speaks as res ipsa loquitur. Lucifer continues to seethe in exuberance as he watches the unlimited human attempts at trying to somehow properly order that which is a diabolical rearrangement of ordered reality, the so called, “vatican council II” documents, as if the human intellective power is any match for the Luciferian dialectic, that which we do not even hold naturally, the capacity to imagine, yet alone know. Can we for one iota of one moment believe that the Great Apostasy could occur with the 1.2 billion baptized Catholics the world over actually holding the True Faith in their hearts? The very mention of that rings of utter absurdity, as to be an apostate one had to have once held whichever faith he is now exercising his apostasy from. How else could the Great Apostasy occur without a deception the likes of which has never been critically imagined in the mind of man, yet alone experienced in existential reality? By virtue of the “operation of error” which Saint Paul inerrantly spoke of in Holy Writ, the overwhelming majority of baptized Catholics the world over are now in apostasy without even knowing it and “they have no excuse”, as Saint Paul also bore witness to. All of Holy Scripture applies to all people for all time. The historical-critical belief is itself a novel heresy. To inject this historical-criticism into the understanding of Holy Scripture defies Almighty God’s Omnipotence. The one Christ Jesus especially loved, Saint John the Evangelist, told us that all of what Christ said and did in His 3 year ministry, could not be contained in all of the books present on the earth. That was a mysterious commentary on the reality that every Truth contained in Holy Scripture has an infinitely understood potential for its specific applicability to any and all human persons, each and every one individually, until the end of time. Our Lady of Fatima, our Mother, our Love, the Mother of the One Who Is Love, please pray for us and hold us in your Immaculate Heart, such that you may carry us unto your Sacred Heart, our Blessed Dominus Deus Sabbaoth and Savior, Jesus the Christ, Son of the Living God. Amen. Alleluia. In caritas. Hm. I agree in principle with what you have written here. One sentence I question in particular, “they have no excuse”. 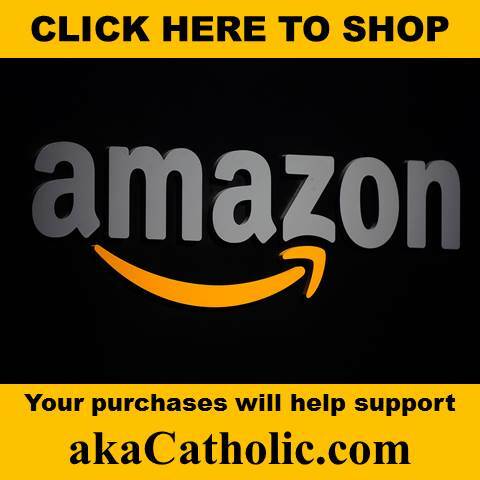 While we are all responsible for knowing Scripture because “ignorance of Scripture is ignorance of Christ”, the very nature of the Catholic faith relied heavily on a top-down way of instruction. Let’s face it, we relied on the pope and magisterium throughout history. The pope as the vicar of Christ has a singular weight in Catholic instruction, unquestionably, and for good or ill (now very ill) we see how that has worked against us in our current situation. There is no avoiding this truth. I don’t know, at all, God’s judgments or how God will look at things like culpability. I could be right or totally off track. But we have been led astray, we did not lead ourselves. The pope, the Cardinals, the bishops, the priests, the religious, these men and women bear the serious weight of responsibility. The laity are also responsible, yes, but surely in a greatly reduced proportion to the ones who led them astray. I feel that this would call into question “they have no excuse”. I think we have some excuse. I would say many must bear more responsibility since it is every Christians duty to know the faith. We are told to always be prepared to give witness. While I was very young during the revolutionary years of the 60s, I cant help but to assign some of the blame to my parents generation. They were all taught in Catholic schools by nuns and priests. Their parents were very devout. Yet as soon as someone in authority came around preaching a false gospel, they fell for the lie. I suppose they were taught obedience before doctrine. Pay particular attention to what is said regarding specifically just Whom it is that made it evident to them, “…because God made it evident to them.”. Saint Paul did not profess that Saint Peter nor he nor any of the Apostles made it evident to them, rather God Himself did. Christ told us that His sheep will know their true Shepherd. In knowing the Shepherd, the flock must know the Faith, as the Shepherd is known to the flock in the Faith. The Faith is what binds the sheep to their Shepherd. Knowing the Faith in this context is knowing it as an innocent child would know it, by virtue of complete submission, and not as a theologian would know it intellectively. Notice also what is said here, “…of those who suppress the truth by their wickedness.”. The truth is not somehow suppressed by the wolves in sheep’s clothing, rather the truth is perverted by the wolves. To those who receive the grace, that gift which flows from the Redemption of Jesus the Christ as God and is both freely given and completely undeserved, the lie masquerading as the truth is evident, as God made it evident. On the contrary, it is each individual, miserable, human creature, by virtue of his own free will assent, who by his own acts of impiety and wickedness, is given the operation of error in lieu of grace, which he freely rejects through this impiety and wickedness. He is then intellectively blinded to the truth that rests precisely in his midst, because he willed the blindness in lieu of grace and thus Almighty God gives him precisely that for which he has asked. The perversion of the truth presented to each who has received the operation of error, by virtue of their own willful assent, then becomes appealing to their flesh, as Holy Scripture refers to this as the “itchy ears”, in the Letter to the Galatians, if I am served by my memory. I pray this helps. In caritas. This poor chap has been listening to too much Frank Sinatra. On a completely different topic, I just wanted to thank Louie for this open forum. I have no idea if he has ever disagreed with what I have had to say, but never once has he deleted any of my comments as have just about every other traditionally oriented web forum. Thank you, Louie. Secular news clip regarding Fatima. Are we really to believe this? Did Our Lady come here the 13th of 6 consecutive months and perform the most spectacular miracle since the resurrection of Her Son because John Paul2 would be shot on the 13th of May 1981. (Cough cough-TRUMAN SHOW!) Oh yes, 70,000 people by the way witnessed this miracle in 1917. It was all about jonhpaul2. And he read the message for the first time? Honestly? He put the bullet in the crown? Huh?? Heartwrenching. Our Dear Lady’s Crown. It is either all true, and He was extremely innocent, honest, grateful and loving or not.